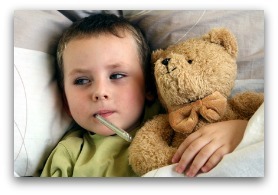 It drives us frantic when our children are sick and scrunched up in pain. Apart from that, children's tummy aches are a real cause for concern, but how on Earth can we help? First of all, we have to find out what's wrong, but recognizing acid reflux in children can sometimes be tricky, especially with a toddler. Is there a bitter taste in the back of your mouth? And so on. It’s probably acid indigestion if s/he reports a burning sensation in the chest or solar plexus area, especially if it’s accompanied by a nasty taste in the back of the throat. If this is the case, dose the child with half a teaspoon of 'Arm and Hammer' bicarbonate dissolved in a third of a glass of warm water. If the pain goes away you can be sure that it is heartburn and you can relax a little. Ordinary heartburn is uncomfortable, but it's not dangerous. However, you should be on the alert for further symptoms indicating a more serious condition, namely GERD. Regurgitation after eating followed by a nasty taste in the back of the throat. Excessive drooling -- a condition known as 'water brash'. If one or more of the above are presented, it’s time to introduce a few dietary and lifestyle changes - not only for acid reflux in children, but also for the entire family. Replace Coke, Pepsi and other fizzy drinks with non-carbonated fruit juices. Make sure they drink plenty of filtered or bottled water. Elevate the head of the child’s bed by placing by four to six inch high blocks or bricks under the feet. Specialized treatment is absolutely essential for the small percentage of babies and young children who develop GERD. If gastric juices enter the windpipe, problems such as bronchitis, pneumonia and asthma are sure to follow. In the worse case scenario, Sudden Infant Death Syndrome (SIDS) could result. Gastric acid continuously splashing the walls of the food pipe causes inflammation that could lead to esophagitis. Ulcers soon appear in the food pipe, followed by scarring. These scars pucker and shrink the walls of the esophagus causing it to narrow. These strictures can block the esophagus and prevent food from reaching the stomach. If an ulcer ruptures, it could lead to life-threatening internal bleeding... Beware of black or bloody stools. This is a fairly rare condition that occurs in a small percentage of sufferers. However, this condition is dangerous! If left untreated it could lead to a deadly form of cancer. Make sure that your child does not take these medications for more than 8 weeks without further evaluation (see Nexium side effects). In extreme cases the doctor may recommend surgery, such as the Nissen fundoplication procedure. If this happens, calling for a second opinion from a Gastroesophageal Reflux Disease Specialist is essential. that will help the whole family.